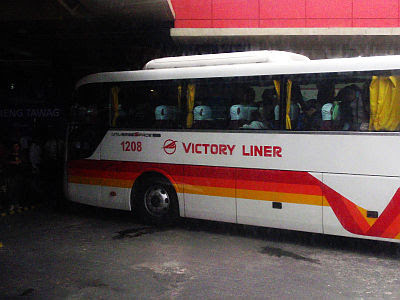 In the absence of direct flights from Manila to Baguio, the most convenient public transportation going to Baguio is offered by Victory Liner via its deluxe bus service to the summer capital. Tutubi recently went to Baguio for an official trip that coincided with the Panagbenga Festival. He first took an ordinary air conditioned bus from Cubao to Baguio (mainly because his office mate wasn't able to reserve ticket on time which usually sold out early for the Baguio flower festival) and the deluxe bus service on the return flight. Victory Liner Deluxe Bus service is called as such that it uses a special 29-seater bus equipped with its own toilet/CR/washroom (aircraft terminology: lavatory), a service attendant (sterwardess or "flight" attendant) and bus fare inclusive of light snacks (a bottle of mineral water and pack of Cream-O chocolate cookies). The seats can be reclined much more than the those of the ordinary aircon buses, comes equipped with legrests and footrests to make your legs stretch just enough for you to lie down. Also unlike the ordinary aircon bus trips, the deluxe service don't make three stopovers due to the presence of the on-board lavatory taking about 45 minutes off the travel time. The deluxe bus service's 29 seats, all equipped with seat belts, are numbered 1 to 29 with seat numbers 1, 4, 7, 10, 13, 17, 20, 23, 26 on the left column window side; seat numbers 3, 6, 9, 12, 19, 22, 25, 29 right column, window side (recommended if you want to be alone or disturbed by your seatmate). The rest are middle aisle side. Seat number 19, the seat of Tutubi, is facing the toilet. There are free snacks, wireless Internet (wifi), power outlets for charging your gadgets like in an airplane, more legroom and sometimes android tablets for your use. There are also two video monitors for films shown during the trip. (They played Sherlock Holmes and Surrogate with Blu-ray copies, pirated films really) plus free Internet Wifi and android tablets for use of passengers to while away time. 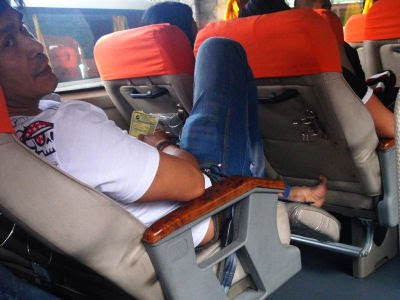 the deluxe bus service comes with ample leg room, much more than the ordinary aircon buses, reclining seats, and leg rest but not not enough for you to lie down. Call Victory Liner telephone number for ticket reservations to reserve tickets and pick up a few days before the trip to avoid ticket cancellations. This is specially true for holidays particularly long weekends and Holy Week and peak season that is Panagbenga Festival on the last Sunday of February. If you're like Tutubi who enjoys the "trees and not just the forests" by looking out the window to see the scenery, request to be seated window side. To avoid direct sunlight when traveling during the day, request to be seated on the left column (facing the driver) when traveling from Manila to Baguio in the morning and right column in the afternoon since you're basically traveling northbound. A similar Gold bus service by Philtranco plies the Manila to Legazpi City and Manila to Daet (Camarines Norte) route taken by Tutubi in 2008 for the Daet and Calaguas Island trip. On the return route: bus stops are Camachile on NLEX and on EDSA there's Paramount (the no longer extant Paramount Theater at the corner of West Avenue and EDSA in front of SM City North EDSA), Quezon Avenue (under the Quezon Avenue viaduct in front of Centris Station), and Kamuning and finally at Victory Liner Cubao Station. we usually ride victory liner buses too when going to baguio; although we took a huge van during our last trip 2 years ago when we stayed there for 4 days and savored panagbenga 2008.
it's my first time actually to know that such deluxe buses are now available at victory liner. i know farinas in lacson ave, manila has those "luxury" buses with toilets and all; bound to ilocos norte. how was this year's panagbenga? this is such useful information, thanks! anyone know how much the to manila to baguio, tagaytay, batangas, pulilan bulacan. hi, how much na po current rate ng aircon bus from pasay to baguio? pinakabastos na mga conductor! Walang modo! Manila - Baguio trip only one @ 10:50pm? No day time trip? inquire lang po how much is the fare pasay to baguio? hi tatanung ko lang po mag kanu pamasahe papuntang dagupan? hindi po ba 24 hrs ang byahe ng cubao to baguio? I mean, wala po bang byahe every hour? tanong ko lang po kung may byahe po ba ung deluxe bus niyo every hour? o may specific time tlaga ng oras ng alis? kailangan po ba talagang mag avail ng ticket ng mas maaga sa araw ng alis? anong oras po ang 1st trip at last trip? Question...uhm how will u go to Victory Liner Cubao if u r from Katipunan? wala nman sa tsas nkalagay na may pang araw na trip going to baguio. bsahin u kya ng mabuti para lam mo? hi. i will be traveling to baguio with my 3 year old kid. alam nyo po ba kung the same lng din ung fare for the 3 year old if deluxe bus? hi...i would like to ask if deluxe bus from pasay to baguio will have stopover in dau, pampanga? how much will be the fare on deluxe from pasay to dau if ever? thank you so much! Very Dangerous!!! Imagine Walang pahinga ang driver!?? Ihulog nya pa ko sa Bangin! hi, I'm just wondering if I have to make a reservation for a ordinary bus in pasay to baguio? or all i have to do is to drop there and ride? just like the ordinary buses? Hi do they have student discount? for my sister sana na isasama ko sa Baguio. 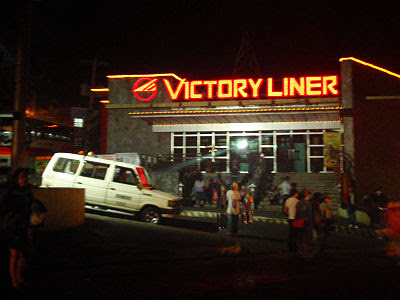 gud eve,san po ba ang exact location ng victory liner sa cubao. ilang hours from manila to baguio pasay terminal deluxe bus? ilang hours from baguio to manila pasay terminal deluxe bus? Magkano npo kaya ngaun ang fare from cubao to baguio? Presyo ng deluxe and ordinary aircondtion bus? And sched of trips nla? excuse me po.san po ba na terminal pupunta ung ipinadala ko papuntang baguio?sang terminal kukunin ? Hi, ask ko lng po if how much fare from baguio to pampanga?